In the modern day of franchise management, whenever a product such as a movie is released, one can always expect multiple merchandising extensions of that product, be it clothes, spin offs, and even novels. The video game Star Wars Battlefront was released in 2015 as part of Disney’s 2015 push to assert itself as the new owner and producer of the Star Wars franchise. Along with Battlefront, Disney produced a television show (Rebels) and a half a dozen novels, and additional books. Other games also were released, such as the Star Wars Topps Trading Card Game, as well the post-Return of the Jedi Anoat system based Star Wars: Uprising. 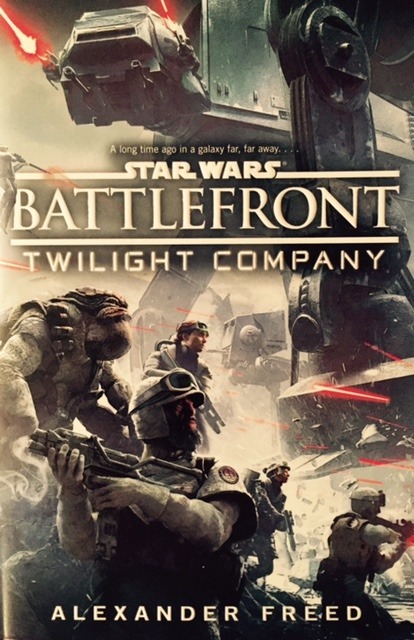 Of these games, only Battlefront earned a tie-in novel, Battlefront: Twilight Company. Written by first time novelist, though long time writer, Alexander Freed, many undoubtedly had low expectations for a book based on a video game. If Mr. Freed entered into his work with the same mindset, he failed horribly at his task, as Battlefront: Twilight Company is one of the best new additions to the Star Wars canon. Nominally, Battlefront: Twilight Company tells the story of the 61st Mobile Infantry of the Rebel Alliance and the battles they fight in a time span that runs from after the destruction of the first Death Star to a period after the fall of the rebel base on Hoth in The Empire Strikes Back. Specifically, Twilight Company is truly about a somewhat cynical career soldier, Hazram Namir, who we meet as the top sergeant of the company. Namir’s story is told through a series of flashbacks, from a child soldier on a backwater and less technologically advanced planet of Crucival (its similarity to crucible is undoubtedly intended), who joins one warring faction after another and then ultimately, the Rebel Alliance. Namir is an interesting and complex character and Twilight Company succeeds because Freed convincingly uses nearly 400 pages to unhurriedly portray Namir’s evolution from a cynic, but loyal, soldier to the Rebel Alliance to someone who finally understands and believes in the Rebellion, itself. Namir is joined by a fair number of supporting characters, who are themselves layered and nuanced. The more time dedicated to each of these characters, such as Namir’s friend, former bounty hunter and sniper Brand, or the philosophical four armed Besalisk Gadren, the more dimensional they become. Two characters stand out from the crowd due to Freed’s decision to expand the character development in Twilight Company. Both are women who are in the process of either leaving or entering the service of the Galactic Empire. The first is Thara Nyende, a human living on Sullust, who enlists in the Stormtrooper Corps and becomes SP-475. Similar to the main characters of Claudia Gray’s Lost Stars, Thara provides a window into how otherwise normal and decent individuals can find themselves swept up into service of the Empire. Thara’s story exists independent of Twilight Company’s until the very end of the novel when the two are momentarily woven together. The second character is Everi Chalis, a former emissary of the Imperial Ruling Council and essentially exiled to a governorship on the planet Haidoral Prime. A former pupil of Count Denetrius Vidian, the villain of A New Dawn, Chalis defects to the Rebel Alliance after the rebels successfully take control of her planet, something she believes she would be punished for by the Empire, regardless of her role in its loss. Chalis is presented as suspect in her motivations, both in the text and through the perceptions of Namir, and only during the Battle of Hoth do her actions truly begin to present someone trustworthy. After Namir, Chalis represents the most layered character of Twilight Company, and also a second expression of how one enters service with the Empire. Unlike Thara or SP-475, Chalis found herself falling into the service of the Empire to escape an impoverished background, particularly after she came to the attention of Count Vidian. There was no seduction of the Empire as something ‘good’ or at least something which brought order, but only a system that existed to be exploited for personal gain, regardless of what personally detested actions it took Chalis to rise up that Imperial ladder. As her story evolves alongside Namir’s her true intentions become murky enough that it’s not clear whether Chalis realizes them or not. None the less, she is well written as the nemesis turned ally, a woman who learned to manipulate the world around her not just for advancement, but also as a shield against developing relationships. The main antagonist of the story is war, introduced as a permanent construct for Namir in the very beginning of the novel. Against it, our main character repeatedly struggles as Namir gradually learns to appreciate that there is more to it than simply military victory. War is vicious in Twilight Company, repeatedly taking the lives of those close to Namir and characters who quickly leave positive impressions upon the reader, as well making life miserable for those who survive. As a result, the personified antagonists of the novel, Prelate Verge, an Imperial wunderkind, and Captain Tabor Seitaron, a veteran of the Empire’s rise pulled from comfortable retirement at an Imperial academy, are not quite as interesting. Both characters are interesting and developed, but while they fall into pursuit of hunting down former Governor Chalis, their hunt never seems to take on much urgency or provoke concern for the wellbeing of Twilight Company. Repeatedly, after all, it’s the war itself which puts our characters in risk’s way, and only by the end of Twilight Company do the pair actually do this themselves in a forward and upfront manner. For those looking to the pair to play the chief role of villain, this is a weakness, but if the intent of the story is more about the personal experiences and development of the members of Twilight Company, it’s not really that important. Across the many worlds and multiple battles which Twilight Company carries the reader, Freed manages to avoid any sense of repetition. Instead, he manages to bring out an uniqueness to every engagement, and as cinematically familiar battles go, provides a distinctive telling of the Battle of Hoth, which touches upon familiar moments in The Empire Strikes Back, and at the same time, provide fresh background to the engagement. Familiar characters of the Original Trilogy do appear, such as Darth Vader, but their roles in the novel manage to avoid stealing the spotlight and at times, even happen without said characters being named. Perhaps the sole exception is Darth Vader, who appears only briefly, but terrifyingly so and in his pursuit of Luke Skywalker, forever alters Chalis’ own self-perception. Battlefront: Twilight Company arrived in the shadow of a marketing blitz, the second sister to the bigger product, Star Wars: Battlefront. As a result, expectations were low and the bar to meet within easy grasp, but Alexander Freed opted to make his debut novel something greater. Instead of a throw away novel about a video game, we instead received one of the best additions to the new Star Wars Expanded Universe, and the examination of how one man gradually shifts from cynic warrior to inspired leader. Battlefront: Twilight Company is a must read for anyone who enjoys the Star Wars canon, and may prove enjoyable to those with little affinity for the Star Wars franchise, but who appreciate well written adventures against the back drop of galactic war.